Losing friends may sound like a bad thing at first, but in reality, it’s not bad at all. It’s normal that friendships evolve over time. If you began to notice that you’re keeping regular contact with fewer people than you did a decade ago, there’s nothing to worry about. In fact, it’s probably a good thing. As we age, we tend to stay friends with those who really understand us. A sincere and deep connection doesn’t come around often, but chances are that people who are still your friends are very loyal and that your friendship stood the test of time. Here are some things you might experience as you get older that affect the ways in which you view interpersonal connections and value friendship in life. These will also help you to understand that losing friends is completely natural and in most cases a good thing. When you were young, you were probably much more willing to turn a blind eye to the faults of people you met, choosing instead to focus on other aspects like their vitality or personality. As you grow older, you’ll have less patience for insincerity and shallow relationships. Age teaches us that it’s much better to have few sincere friendships, than a ton of superficial ones. An honest conversation is your priority in interpersonal relationships now – and that’s a good thing! As you grow older, your time for socializing will simply shrink. It might have to do with professional demands or starting a family – the point is, you’ll simply have less time on your hands and chances are that with age you’ll learn to properly value it. That’s why you’ll choose not to waste it on people whose company you don’t really enjoy that much. You’d rather save your time for people who matter to you and for relationships that you find rewarding. Losing friends that don’t matter so much isn’t a big deal in this case. Throughout your life, you probably saw many friends drift away at the first sign of trouble. Good thing is, as you age, you become surrounded by friends who were at your side through the good and the bad. You shared many experiences and that’s how you created a deep bond. You don’t need anything more than this in your life, so it’s only natural that you stick to your friendships even more. Over the years, you’ve learned how sometimes it’s alright to rely on your friends and other times to provide support yourself. This experience shows you who you can really depend on, helping you to decide into which friendships you should invest your time. It’s likely that only a few people will make it to the final cut – and for a good reason. Your life experience taught you about the value of interpersonal relations, so you’re able to tell who deserves your attention and time. As you get older, you might grow more protective of personal information and choose to share it with a select group of people. You no longer want to expose your personal life to everyone, but rather talk things over with your friends who you know you can rely on in any situation. When you were young, you had all the time and energy to go to parties and mingle with lots of new people in one night. These days, you probably see how fleeting and superficial all these relationships were. You have no patience for that anymore. Rather than go out and meet new people, you prefer to visit one of your friends and share a glass of good wine together. Aging leaves less room for relationships that aren’t sincere or valuable, so it’s only natural that while some friends drift away, others stay firmly by your side. If you feel that your friend circle has shrunk over the years, there’s no reason to panic – this is something that happens to all of us as we grow older and make wiser decisions, including those about our friendships. 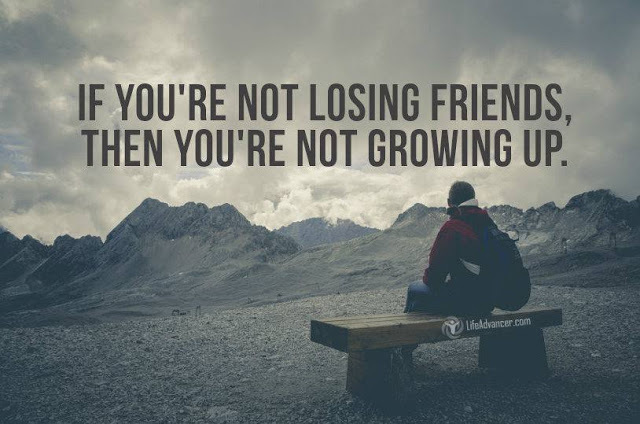 So, as you see, losing friends during your lifetime isn’t a bad thing at all – it’s just a result of knowing better what you want in life and becoming more picky with people. This post was republished from lifehack. You can find the original post here.